It’s been too long since I reviewed a tea, but since I’ve been traveling to Seoul, South Korea this week, I’ve had a chance to try a few new ones. 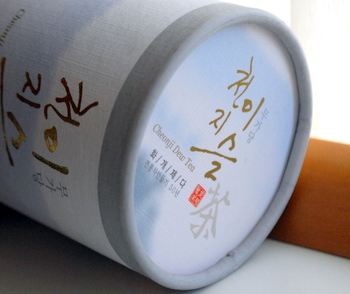 This one is Cheonji Dew Tea, which I bought from a shop in Insadong, although I did see it at several other stores. The name of the tea itself, according to the woman at the shop, was Iseul Cha, or Dew Green Tea. The tea is a green tea that comes from one particular mountain area. The tea doesn’t look like leaves. It actually resembles small, soft branches or sheets of bark, each piece of which can be used for several pots. The “ah-ha!” moment here comes when you first taste the tea. It is very, very sweet – almost like someone has stirred a lot of honey into your tea without changing the consistency of it at all. And all that sweetness is completely natural! It is absolutely delicious and the tea is also caffeine free. The woman at the shop told me that it’s very popular with children, especially children who don’t normally care much for plain tea.